This is another fill-in/inventory issue, written by former X-Men inker Terry Austin, with pencils from Colleen Doran (who drew the never-released second Fallen Angels miniseries) and inks by former New Mutants penciler Bret Blevins. The villains of the story are the unfortunately-named Cooter, a woman with the ability to creature illusions, and her companion Bash, a typical super-strong bruiser type. I believe this issue marks their first and only appearances. Brian begs off drinking while at the Gilded Lilly, citing his alcoholism. While Brian's drinking problem has been mentioned before in the series, I don't remember ever being told or shown that he's acknowledged the problem to the point of admitting he's an alcoholic and refusing to drink as a result. Cooter's power involves playing on people's greed to make them see false images, though people who are exceedingly honest or that lack imagination are immune. Meggan is said to be the former, while Brian the latter. 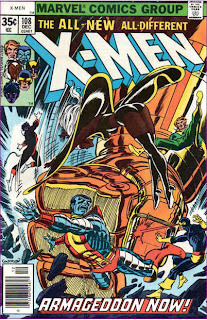 When Cooter focuses her power on Meggan, she sees Brian as Nightcrawler. Yet another fill-in issue/inventory story, but as Excalibur fill-ins go, this isn't too bad. 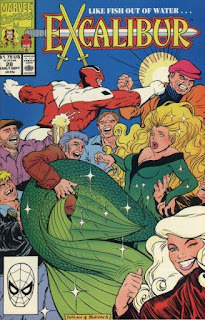 It's entirely inconsequential, doing some light character work with Captain Britain and Meggan, but otherwise not tying in with the series' larger narrative arcs (or any other characters) in any way. But the art from Colleen Doran & Bret Blevins is a standout element, fun, lighthearted and suitable for the kind of story Terry Austin is telling (frankly, given the general tone of Excalibur relative to the rest of the X-books, Doran & Blevins would make pretty good regular artists for the series). But most importantly, this issue doesn't try to do too much by showcasing a significant plot development that is better left to the regular creative team or creating wonky continuity problems by featuring characters and settings that conflict with one another. If that sounds like damning with faint praise, it probably is, but at this point in the book's run, a character-driven fill-in issue with strong, effective art that tells its story but doesn't cause any other narrative problems is downright refreshing and, somewhat sadly, accounts for one of the series' better offerings of late. 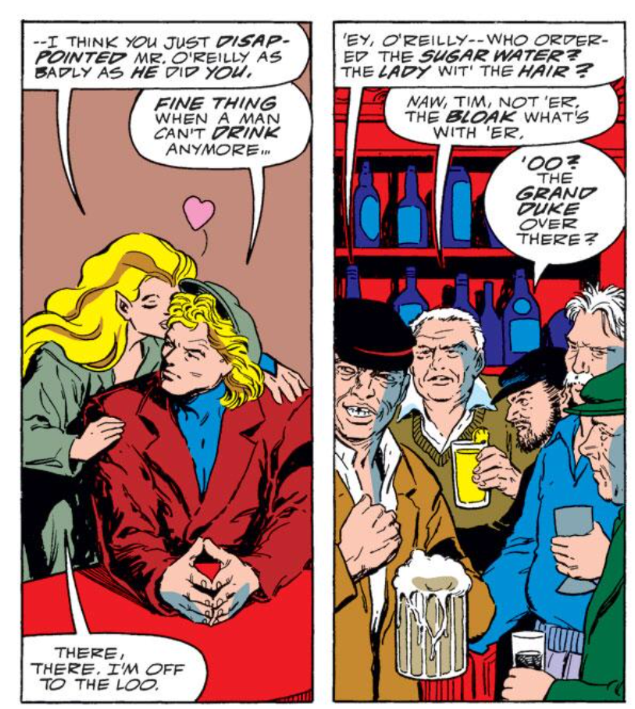 Tomorrow, Larry Hama & Marc Silvestri finally arrive in Wolverine #31. Next week, Beast becomes a prisoner of love in X-Factor: Prisoner of Love. I don’t think we’ve ever seen Brian as flirtatious with Meggan as he is in the opening pages. That’s “Phil Felix” — and the perfect example of why you have to be careful lettering “Flick” or “Clint” in all-caps. 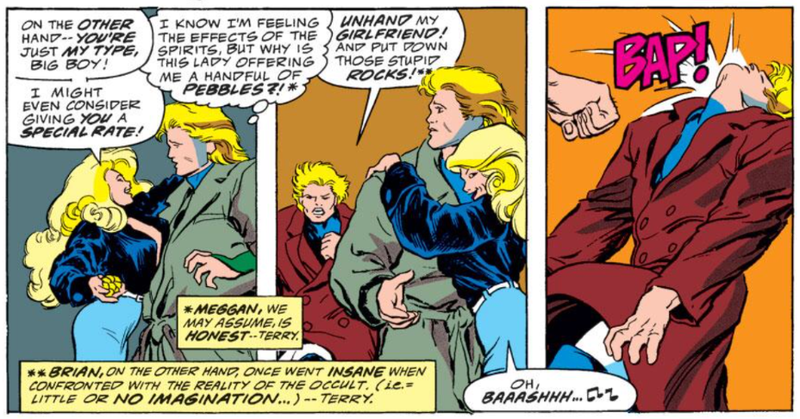 @Blam: I don’t think we’ve ever seen Brian as flirtatious with Meggan as he is in the opening pages. Agreed. And given the rocky state of their relationship, it made me wonder if this was a "set in the past" kind of fill-in, but then the Nightcrawler/Meggan stuff got referenced later.